Having pushed back the invasion of Normandy from May to June 1944 to allow more time for training and obtaining additional equipment, Eisenhower decided the attack would occur on June 4, when the tides would be most favorable for a beach landing. On May 30, Leigh-Mallory told Eisenhower he was concerned about reports that the Germans were reinforcing the areas where the 82nd and 101st Airborne Troops would be landing. Leigh-Mallory estimated that only 30 percent of the troops would land safely and be able to fight. The airborne plan was a critical part of the invasion strategy, and it was required to ensure that the Allies kept pressure on the Germans from the rear as the landings occurred. On Saturday, June 3, Eisenhower believed everything would go as on schedule. However, during the day, he began receiving forecasts of stormy weather for June 5. With the weather conditions continuing to deteriorate, Eisenhower decided to delay the invasion for twenty-four hours. On the evening of June 4, as Eisenhower sat in the dining room with his commanders, Stagg came in to report a break in the weather. The rain would stop within two or three hours, followed by thirty-six hours of relatively calm weather and mild winds. Eisenhower sat quietly. Smith told him it was a “helluva gamble.” Eisenhower looked at Montgomery. “Do you see any reason for not going on Tuesday?” he asked. “I would say—go!” Montgomery replied. With this, the command was given to start moving five thousand ships toward France. With the weather getting worse, there was one more opportunity to stop the airborne operation and the invasion, and delay to July. At 3:30 a.m. on June 5, Eisenhower met with Stagg and his commanders again. The weather prediction was the same—a small window of opportunity for the invasion. As the meeting continued, the rain stopped and the clouds began to disappear. It was one of the most courageous and important decisions ever made by a leader. 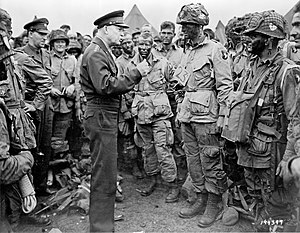 Later that day, Eisenhower went to visit the 101st Airborne for informal conversations and to wish them well. The men told him not to worry—one even offered him a job after the war. Eisenhower stayed until the last plane left. He went back to his headquarters to wait and listen for the results of the invasion.